More than thirty years ago on what then seemed like a whim, I enrolled in a Brush Painting workshop. Faced with the immediacy of just brush, black ink and rice paper, it was love at first stroke. This was fortunate since my enthusiasm kept me working at it even though my first efforts were like any beginner's - weak, uncontrolled squiggles interspersed with heavy splotches of black ink. The philosopher Joseph Campbell speaks of "following one's bliss". Now, when I paint, I am nourished by what appears on the paper, as though the beautiful object takes on a life of its own and bestows a blessing on me, even though I created it. I believe that what I am doing is giving form to "chi" or life force. Is this "chi" my spirit, the expression of my passion? Or am I simply the channel through which it manifests? Clearly, who I am colors the image, but when a dancing flower or a "bird with attitude" pops out of my brush it contains its own, unique essence. 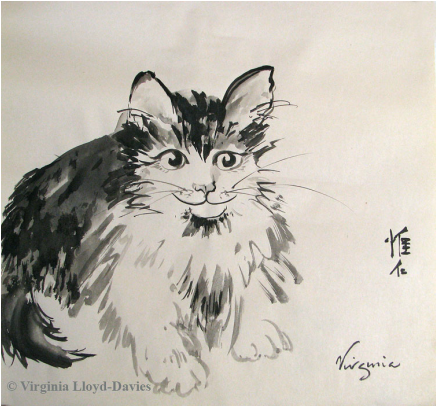 Hand-in-hand with the "chi" or spirit in Chinese Brush Painting is "yun", the training or practice of the melody. No amount of personal passion will produce a successful painting if the discipline of the strokes is not there, any more than the pianist can play a Chopin waltz without hours of scales. After decades of study, I have probably painted enough bamboo leaves to encircle the globe, yet I still "warm up" before a big painting, practising strokes, playing with my brush, sometimes painting in the air above the paper. Creating a painting in front of an audience is particularly exciting. Since there is no pre-sketching on the rice paper and no erasing the ink stroke once it is made, the performance has to be right the first time - no second chances, no room for error. Somehow, the energy of the people watching is woven into the performance and the painting becomes an expression of our combined "chi". So who is the viewer, and who the painter? I invite you to share in the spirit of the images themselves, born of passion and discipline, "chi" and "yun", created in a time-honored medium that still speaks directly to the modern heart and soul. May it bring you joy.